Gonstead Technique Who was Dr. Gonstead? 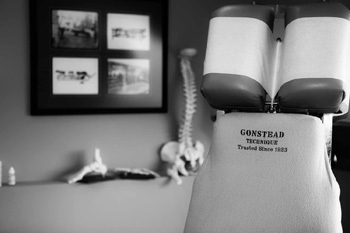 The technique we utilize is the Gonstead system, which takes great care to ensure a mechanically correct position and precise thrust to provide the most accurate and painless adjustment possible. (Above All, Do No Harm) It is also interesting to note that because of his detailed study of the spine, he taught that rotation or twisting of the spine during the chiropractic adjustment was harmful to the patient. Current Chiropractic, Osteopathic, and Medical literature links twisting of the spine to accelerated degeneration of the cushion pad, or disc, located between the spinal bones. The twisting motion associated with crude methods of “manipulating” the neck or cervical spine has also been implicated as the major factor in the rare incidence of stroke associated with chiropractic “treatment”. This tragic occurrence, occasionally reported in scientific literature and the popular press, has diverted attention away from the enormous benefits of properly administered chiropractic care.